Stems: Erect or lax, single or branched upward, glabrous or strigous, paper-like sheaths at leaf bases. Leaves: Variable, alternate, simple, rust-colored with age, ovate-lanceolate to oblong-lanceolate, 1 to 10 inches long and up to 2.5 inches wide, glabrous to stiff-hairy, usually not reduced above; margins often undulate; tips tapering to points; stalks .5 to 2.8 inch long; stipules entire. 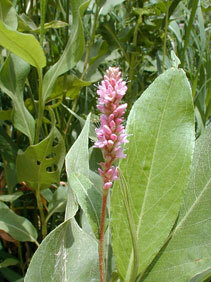 Inflorescences: Spikes, 1 or rarely 2, erect, cylindrical, 1 to 6 inches long, dense, terminal on stem. Flowers: Perianth, 1/6 to 1/5 inch long, pink or rose; perianth segments 5, united, tips free; stamens 8, different length from styles, extending beyond perianth lobes; styles 2. Fruits: Achene, egg-shaped to round, lens-shaped, 1/10 inch long, dark glossy; seed 1, small. Habitat: Low, wet areas of roadside ditches and crop fields, and along stream banks and the shorelines of ponds and marshes. Distribution: Throughout Kansas, but more frequently in eastern 1/2. Uses: The seeds are eaten by waterfowl and racoons. Native Americans used young shoots of swamp smartweed as a relish in the springtime, the roots to treat mouth sores, and the plant to brew a tea for stomachaches. Comments: Reproduces by rhizomes, so it occurs in patches.